ST. PAUL, Minn. — Zebra mussels often elude human inspectors that search boats being hauled into and out of Minnesota lakes. This year, they might have a harder time escaping the state’s new inspectors: three dogs specially trained to sniff out the tiny invasive species. 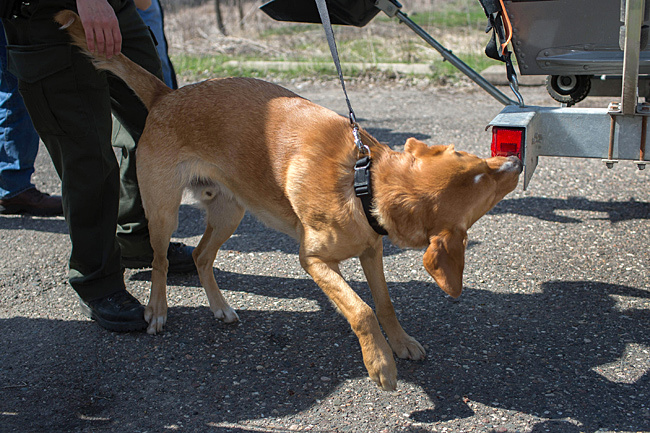 On Tuesday, labs Brady and Digger successfully found zebra mussels hidden inside a boat trailer’s taillight during a demonstration with their handlers, conservation officers with the Minnesota Department of Natural Resources. More than 100 Minnesota lakes, rivers and wetlands are already infested with zebra mussels, which clog water intake pipes, cut swimmers’ feet and disrupt the natural ecosystem. The DNR plans to use three zebra mussel-detection dogs this spring and summer in addition to between 126 and 146 human inspectors to check boats. “The dogs are going to be able to inspect watercraft and vessels a lot faster than humans, and a lot of times more successfully because they’re using their nose instead of their eyes,” said Travis Muyres, one of the DNR conservation officers working with the dogs. Muyres traveled to California this year to learn about that state’s use of dogs to find zebra and quagga mussels, another invasive species. California is using more than a dozen dogs to inspect boats. “They figured it was five to 15 times faster” to use dogs, Muyres said. The dogs and their handlers went through five weeks of training that involved teaching the dogs to identify the scent of zebra mussels. During the demonstration, two of the dogs took turns circling the boat and sat down when they picked up the zebra mussels’ scent. They were then rewarded with a ball. 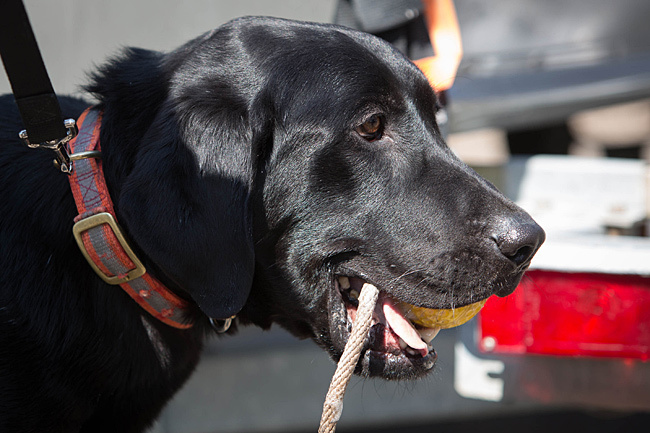 The DNR will see how the dogs perform this year and decide whether to expand the program. The dogs are also being trained to detect wildlife such as deer to help find poachers and could also be trained to smell firearms. The DNR already has K-9 units, so Muyres said adding the zebra mussel dogs was not a big expense. One of the dogs was purchased from a breeder, but the other two came from shelters. Muyres said it was challenging to find dogs that would be a good fit. The dogs and human inspectors will target high-traffic lakes, or lakes the DNR has deemed susceptible to zebra mussel infestations. Muyres said the inspectors are only a small piece of the effort needed to stop the spread of zebra mussels. Elizabeth Dunbar is a general assignment reporter for MPR News.